This article is about the molecule. For the group of chemicals containing a phenol group, see Phenols. "Carbolic acid" redirects here. It is not to be confused with carbonic acid. Phenol is an aromatic organic compound with the molecular formula C6H5OH. It is a white crystalline solid that is volatile. The molecule consists of a phenyl group (−C6H5) bonded to a hydroxy group (−OH). It is mildly acidic and requires careful handling due to its propensity for causing chemical burns. 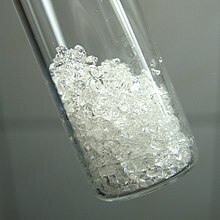 Phenol was first extracted from coal tar, but today is produced on a large scale (about 7 billion kg/year) from petroleum. It is an important industrial commodity as a precursor to many materials and useful compounds. It is primarily used to synthesize plastics and related materials. Phenol and its chemical derivatives are essential for production of polycarbonates, epoxies, Bakelite, nylon, detergents, herbicides such as phenoxy herbicides, and numerous pharmaceutical drugs. Phenol is an organic compound appreciably soluble in water, with about 84.2 g dissolving in 1000 mL (0.895 M). Homogeneous mixtures of phenol and water at phenol to water mass ratios of ~2.6 and higher are possible. The sodium salt of phenol, sodium phenoxide, is far more water-soluble. Compared to aliphatic alcohols, phenol is about 1 million times more acidic, although it is still considered a weak acid. It reacts completely with aqueous NaOH to lose H+, giving the salt sodium phenoxide, whereas most alcohols react only partially. One explanation for the increased acidity over alcohols is resonance stabilization of the phenoxide anion by the aromatic ring. In this way, the negative charge on oxygen is delocalized on to the ortho and para carbon atoms through the pi system. An alternative explanation involves the sigma framework, postulating that the dominant effect is the induction from the more electronegative sp2 hybridised carbons; the comparatively more powerful inductive withdrawal of electron density that is provided by the sp2 system compared to an sp3 system allows for great stabilization of the oxyanion. In support of the second explanation, the pKa of the enol of acetone in water is 10.9, making it only slightly less acidic than phenol (pKa 10.0). Thus, the greater number of resonance structures available to phenoxide compared to acetone enolate seems to contribute very little to its stabilization. However, the situation changes when solvation effects are excluded. A recent in silico comparison of the gas phase acidities of the vinylogues of phenol and cyclohexanol in conformations that allow for or exclude resonance stabilization leads to the inference that about ​1⁄3 of the increased acidity of phenol is attributable to inductive effects, with resonance accounting for the remaining difference. The phenoxide anion has a similar nucleophilicity to free amines, with the further advantage that its conjugate acid (neutral phenol) does not become entirely deactivated as a nucleophile even in moderately acidic conditions. Phenolate esters are more stable toward hydrolysis than acid anhydrides and acyl halides but are sufficiently reactive under mild conditions to facilitate the formation of amide bonds. Phenol exhibits keto-enol tautomerism with its unstable keto tautomer cyclohexadienone, but only a tiny fraction of phenol exists as the keto form. The equilibrium constant for enolisation is approximately 10−13, which means only one in every ten trillion molecules is in the keto form at any moment. The small amount of stabilisation gained by exchanging a C=C bond for a C=O bond is more than offset by the large destabilisation resulting from the loss of aromaticity. Phenol therefore exists essentially entirely in the enol form. Phenoxides are enolates stabilised by aromaticity. Under normal circumstances, phenoxide is more reactive at the oxygen position, but the oxygen position is a "hard" nucleophile whereas the alpha-carbon positions tend to be "soft". Neutral phenol substructure "shape". An image of a computed electrostatic surface of neutral phenol molecule, showing neutral regions in green, electronegative areas in orange-red, and the electropositive phenolic proton in blue. Phenol water phase diagram: Certain combinations of phenol and water can make two solutions in one bottle. Phenol is highly reactive toward electrophilic aromatic substitution as the oxygen atom's pi electrons donate electron density into the ring. By this general approach, many groups can be appended to the ring, via halogenation, acylation, sulfonation, and other processes. However, phenol's ring is so strongly activated—second only to aniline—that bromination or chlorination of phenol leads to substitution on all carbon atoms ortho and para to the hydroxy group, not only on one carbon. Phenol reacts with dilute nitric acid at room temperature to give a mixture of 2-nitrophenol and 4-nitrophenol while with concentrated nitric acid, more nitro groups get substituted on the ring to give 2,4,6-trinitrophenol which is known as picric acid. Aqueous solutions of phenol are weakly acidic and turn blue litmus slightly to red. Phenol is easily neutralized by sodium hydroxide forming sodium phenate or phenolate, but being weaker than carbonic acid, it cannot be neutralized by sodium bicarbonate or sodium carbonate to liberate carbon dioxide. When phenol is reacted with diazomethane in the presence of boron trifluoride (BF3), anisole is obtained as the main product and nitrogen gas as a byproduct. When phenol reacts with iron(III) chloride solution, an intense violet-purple solution is formed. Acetone is produced as a by-product. Compared to most other processes, the cumene process uses relatively mild synthesis conditions, and relatively inexpensive raw materials. However, to operate economically, there must be demand for both phenol, and the acetone by-product. In 2010, worldwide demand for acetone was approximately 6.7 million tonnes, 83 percent of which was satisfied with acetone produced by the cumene process. ExxonMobil developed a process in which benzene is hydroalkylated to cyclohexylbenzene. This latter product is oxidized to a hydroperoxide and then cleaved to phenol and cyclohexanone. Cyclohexanone is an important reaction intermediate for making nylon. Therefore, this newer process without producing the acetone by-product appears attractive and is similar to the Cumene Process as a hydroperoxide is formed and then decomposed to yield two key products. Phenol is also a recoverable byproduct of coal pyrolysis. In the Lummus Process, the oxidation of toluene to benzoic acid is conducted separately. An electrosynthesis employing alternating current prepares phenol at both the cathode and the anode. The major uses of phenol, consuming two thirds of its production, involve its conversion to precursors for plastics. Condensation with acetone gives bisphenol-A, a key precursor to polycarbonates and epoxide resins. Condensation of phenol, alkylphenols, or diphenols with formaldehyde gives phenolic resins, a famous example of which is Bakelite. Partial hydrogenation of phenol gives cyclohexanone, a precursor to nylon. Nonionic detergents are produced by alkylation of phenol to give the alkylphenols, e.g., nonylphenol, which are then subjected to ethoxylation. Phenol is also a versatile precursor to a large collection of drugs, most notably aspirin but also many herbicides and pharmaceutical drugs. Phenol is a component in liquid/liquid phenol–chloroform extraction technique used in molecular biology for obtaining nucleic acids from tissues or cell culture samples. Depending on the pH of the solution either DNA or RNA can be extracted. Phenol was once widely used as an antiseptic, its use pioneered by Joseph Lister (see History section). From the early 1900s to the 1970s it was used as a soap, known as carbolic soap. Concentrated phenol liquids are commonly used for permanent treatment of ingrown toe and finger nails, a procedure known as a chemical matrixectomy. The procedure was first described by Otto Boll in 1945. Since that time it has become the chemical of choice for chemical matrixectomies performed by podiatrists. Phenol is also used as a preservative in some vaccines. Phenol spray is used medically to help sore throat. It is the active ingredient in some oral analgesics such as Chloraseptic spray, TCP and Carmex, commonly used to temporarily treat pharyngitis. Phenol is so inexpensive that it attracts many small-scale uses. It is a component of industrial paint strippers used in the aviation industry for the removal of epoxy, polyurethane and other chemically resistant coatings. Phenol derivatives have been used in the preparation of cosmetics including sunscreens, hair colorings, skin lightening preparations, as well as in skin toners/exfoliators. However, due to safety concerns, phenol is banned from use in cosmetic products in the European Union and Canada. Phenol was discovered in 1834 by Friedlieb Ferdinand Runge, who extracted it (in impure form) from coal tar. Runge called phenol "Karbolsäure" (coal-oil-acid, carbolic acid). Coal tar remained the primary source until the development of the petrochemical industry. In 1841, the French chemist Auguste Laurent obtained phenol in pure form. In 1836, Auguste Laurent coined the name "phène" for benzene; this is the root of the word "phenol" and "phenyl". In 1843, French chemist Charles Gerhardt coined the name "phénol". The antiseptic properties of phenol were used by Sir Joseph Lister (1827–1912) in his pioneering technique of antiseptic surgery. Lister decided that the wounds themselves had to be thoroughly cleaned. He then covered the wounds with a piece of rag or lint covered in phenol, or carbolic acid as he called it. The skin irritation caused by continual exposure to phenol eventually led to the introduction of aseptic (germ-free) techniques in surgery. Joseph Lister was a student at University College London under Robert Liston, later rising to the rank of Surgeon at Glasgow Royal Infirmary. Lister experimented with cloths covered in carbolic acid after studying the works and experiments of his contemporary, Louis Pasteur in sterilizing various biological media. Lister was inspired to try to find a way to sterilize living wounds, which could not be done with the heat required by Pasteur's experiments. In examining Pasteur's research, Lister began to piece together his theory: that patients were being killed by germs. He theorized that if germs could be killed or prevented, no infection would occur. Lister reasoned that a chemical could be used to destroy the micro-organisms that cause infection. Meanwhile, in Carlisle, England, officials were experimenting with a sewage treatment, using carbolic acid to reduce the smell of sewage cess pools. Having heard of these developments and having himself previously experimented with other chemicals for antiseptic purposes without much success, Lister decided to try carbolic acid as a wound antiseptic. He had his first chance on August 12, 1865, when he received a patient: an eleven-year-old boy with a tibia bone fracture which pierced the skin of his lower leg. Ordinarily, amputation would be the only solution. However, Lister decided to try carbolic acid. After setting the bone and supporting the leg with splints, Lister soaked clean cotton towels in undiluted carbolic acid and applied them to the wound, covered with a layer of tin foil, leaving them for four days. When he checked the wound, Lister was pleasantly surprised to find no signs of infection, just redness near the edges of the wound from mild burning by the carbolic acid. Reapplying fresh bandages with diluted carbolic acid, the boy was able to walk home after about six weeks of treatment. Phenol was the main ingredient of the Carbolic Smoke Ball, an ineffective device marketed in London in the 19th century as protection against influenza and other ailments, and the subject of the famous law case Carlill v Carbolic Smoke Ball Company. The toxic effect of phenol on the central nervous system, discussed below, causes sudden collapse and loss of consciousness in both humans and animals; a state of cramping precedes these symptoms because of the motor activity controlled by the central nervous system. Injections of phenol were used as a means of individual execution by Germany during the Second World War. It was originally used by the Germans in 1939 as part of Aktion T4. The Germans learned that extermination of smaller groups was more economical by injection of each victim with phenol. Phenol injections were given to thousands of people. Maximilian Kolbe was also killed with a phenol injection after surviving two weeks of dehydration and starvation in Auschwitz when he volunteered to die in place of a stranger. Approximately one gram is sufficient to cause death. Phenol is a normal metabolic product, excreted in quantities up to 40 mg/L in human urine. The temporal gland secretion of male elephants showed the presence of phenol and 4-methylphenol during musth. It is also one of the chemical compounds found in castoreum. This compound is ingested from the plants the beaver eats. Phenol is a measurable component in the aroma and taste of the distinctive Islay scotch whisky, generally ~30 ppm, but it can be over 160ppm in the malted barley used to produce whisky. This amount is different from and presumably higher than the amount in the distillate. 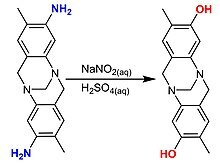 Cryptanaerobacter phenolicus is a bacterium species that produces benzoate from phenol via 4-hydroxybenzoate. Rhodococcus phenolicus is a bacterium species able to degrade phenol as sole carbon sources. Phenol and its vapors are corrosive to the eyes, the skin, and the respiratory tract. Its corrosive effect on skin and mucous membranes is due to a protein-degenerating effect. Repeated or prolonged skin contact with phenol may cause dermatitis, or even second and third-degree burns. Inhalation of phenol vapor may cause lung edema. The substance may cause harmful effects on the central nervous system and heart, resulting in dysrhythmia, seizures, and coma. The kidneys may be affected as well. Long-term or repeated exposure of the substance may have harmful effects on the liver and kidneys. There is no evidence that phenol causes cancer in humans. Besides its hydrophobic effects, another mechanism for the toxicity of phenol may be the formation of phenoxyl radicals. Since phenol is absorbed through the skin relatively quickly, systemic poisoning can occur in addition to the local caustic burns. Resorptive poisoning by a large quantity of phenol can occur even with only a small area of skin, rapidly leading to paralysis of the central nervous system and a severe drop in body temperature. The LD50 for oral toxicity is less than 500 mg/kg for dogs, rabbits, or mice; the minimum lethal human dose was cited as 140 mg/kg. The Agency for Toxic Substances and Disease Registry (ATSDR), U.S. Department of Health and Human Services states the fatal dose for ingestion of phenol is from 1 to 32 g.
Chemical burns from skin exposures can be decontaminated by washing with polyethylene glycol, isopropyl alcohol, or perhaps even copious amounts of water. Removal of contaminated clothing is required, as well as immediate hospital treatment for large splashes. This is particularly important if the phenol is mixed with chloroform (a commonly used mixture in molecular biology for DNA and RNA purification). Phenol is also a reproductive toxin causing increased risk of abortion and low birth weight indicating retarded development in utero. The word phenol is also used to refer to any compound that contains a six-membered aromatic ring, bonded directly to a hydroxyl group (-OH). Thus, phenols are a class of organic compounds of which the phenol discussed in this article is the simplest member. ^ "Front Matter". Nomenclature of Organic Chemistry : IUPAC Recommendations and Preferred Names 2013 (Blue Book). Cambridge: The Royal Society of Chemistry. 2014. p. 690. doi:10.1039/9781849733069-FP001. ISBN 978-0-85404-182-4. Only one name is retained, phenol, for C6H5-OH, both as a preferred name and for general nomenclature. ^ a b c d e NIOSH Pocket Guide to Chemical Hazards. "#0493". National Institute for Occupational Safety and Health (NIOSH). ^ a b c Sigma-Aldrich Co., Phenol. Retrieved on 2013-07-20. ^ a b c "Phenol". Immediately Dangerous to Life and Health Concentrations (IDLH). National Institute for Occupational Safety and Health (NIOSH). ^ a b c Weber, Manfred; Weber, Markus; Kleine-Boymann, Michael (2004). "Phenol". Ullmann's Encyclopedia of Industrial Chemistry. doi:10.1002/14356007.a19_299.pub2. ISBN 978-3527306732. ^ Capponi, Marco; Gut, Ivo G.; Hellrung, Bruno; Persy, Gaby; Wirz, Jakob (1999). "Ketonization equilibria of phenol in aqueous solution". Can. J. Chem. 77 (5–6): 605–613. doi:10.1139/cjc-77-5-6-605. ^ Clayden, Jonathan; Greeves, Nick; Warren, Stuart; Wothers, Peter (2001). Organic Chemistry (1st ed.). Oxford University Press. p. 531. ISBN 978-0-19-850346-0. ^ David Y. Curtin & Allan R. Stein (1966). "2,6,6-Trimethyl-2,4-Cyclohexadione". Organic Syntheses. 46: 115. doi:10.15227/orgsyn.046.0115. ^ Roscoe, Henry (1891). A treatise on chemistry, Volume 3, Part 3. London: Macmillan & Co. p. 23. ^ a b c "Phenol -- The essential chemical industry online". 2017-01-11. Retrieved 2018-01-02. ^ a b "Direct Routes to Phenol". Archived from the original on 2007-04-09. Retrieved 2007-04-09. ^ a b c d Plotkin, Jeffrey S. (2016-03-21). "What's New in Phenol Production?". American Chemical Society. Retrieved 2018-01-02. ^ Wittcoff, H.A., Reuben, B.G. Industrial Organic Chemicals in Perspective. Part One: Raw Materials and Manufacture. Wiley-Interscience, New York. 1980. ^ a b Franck, H.-G., Stadelhofer, J.W. Industrial Aromatic Chemistry. Springer-Verlag, New York. 1988. pp. 148-155. ^ Parmon, V. N.; Panov, G. I.; Uriarte, A.; Noskov, A. S. (2005). "Nitrous oxide in oxidation chemistry and catalysis application and production". Catalysis Today. 100 (2005): 115–131. doi:10.1016/j.cattod.2004.12.012. ^ a b Kazem-Rostami, Masoud (2017). "Amine to phenol conversion". Synlett. 28 (13): 1641–1645. doi:10.1055/s-0036-1588180. ^ Lee, Byungik; Naito, Hiroto; Nagao, Masahiro; Hibino, Takashi (9 July 2012). "Alternating-Current Electrolysis for the Production of Phenol from Benzene". Angewandte Chemie International Edition. 51 (28): 6961–6965. doi:10.1002/anie.201202159. PMID 22684819. ^ "Ingredients of Vaccines - Fact Sheet". Centers for Disease Control and Prevention. 2018-07-12. ^ "How Does Our Lip Balm Work". Carmex. Archived from the original on 18 February 2015. Retrieved 18 February 2015. ^ "CH207 Aircraft paintstripper, phenolic, acid" (PDF). Callington. 14 October 2009. Retrieved 25 August 2015. ^ A. Svobodová; J. Psotová & D. Walterová (2003). "Natural Phenolics in the Prevention of UV-Induced Skin Damage. A Review". Biomed. Papers. 147 (2): 137–145. doi:10.5507/bp.2003.019. ^ Sungthong, Bunleu; Phadungkit, Methin (April 2015). "Anti-Tyrosinase and DPPH Radical Scavenging Activities of Selected Thai Herbal Extracts Traditionally Used as Skin Toner". Pharmacognosy Journal. 7, 2: 97–101. doi:10.5530/pj.2015.2.3. ^ "Prohibited substances in cosmetic product (Annex II, #1175, Phenol) - European Commission". ec.europa.eu. Retrieved 2018-07-06. ^ "CosIng - Cosmetics - GROWTH - European Commission". ec.europa.eu. Retrieved 2018-07-06. ^ Canada, Health (2004-06-18). "Cosmetic Ingredient Hotlist - Canada.ca". www.canada.ca. Retrieved 2018-07-06. ^ Canada, Health (2004-06-18). "Cosmetic Ingredient Hotlist: Prohibited and Restricted Ingredients - Canada.ca". www.canada.ca. Retrieved 2018-07-06. ^ F. F. Runge (1834) "Ueber einige Produkte der Steinkohlendestillation" (On some products of coal distillation), Annalen der Physik und Chemie, 31 : 65-78. On page 69 of volume 31, Runge names phenol "Karbolsäure" (coal-oil-acid, carbolic acid). Runge characterizes phenol in: F. F. Runge (1834) "Ueber einige Produkte der Steinkohlendestillation," Annalen der Physik und Chemie, 31 : 308-328. ^ Auguste Laurent (1841) "Mémoire sur le phényle et ses dérivés" (Memoir on benzene and its derivatives), Annales de Chimie et de Physique, series 3, 3 : 195-228. On page 198, Laurent names phenol "hydrate de phényle" and "l'acide phénique". ^ Gerhardt, Charles (1843) "Recherches sur la salicine," Annales de Chimie et de Physique, series 3, 7 : 215-229. Gerhardt coins the name "phénol" on page 221. ^ Lister, Joseph (1867). "Antiseptic Principle Of The Practice Of Surgery". ^ Hollingham, Richard (2008). Blood and Guts: A History of Surgery. BBC Books - Random House. p. 61. ISBN 9781407024530. ^ a b Hollingham, Richard (2008). Blood and Guts: A History of Surgery. BBC Books - Random House. p. 62. ISBN 9781407024530. ^ Hollingham, Richard (2008). Blood and Guts: A History of Surgery. BBC Books - Randomhouse. p. 63. ISBN 9781407024530. ^ a b c d e "Phenol". Ullmann's Encyclopedia of Industrial Chemistry. 25. Wiley-VCH. 2003. pp. 589–604. ^ "Killing through phenol injection". Auschwitz: Final Station Extermination. Linz, Austria: Johannes Kepler University. Archived from the original on 2006-11-12. ^ Rasmussen, L.E.L; Perrin, Thomas E (1999). "Physiological Correlates of Musth". Physiology & Behavior. 67 (4): 539–49. doi:10.1016/S0031-9384(99)00114-6. PMID 10549891. ^ a b "Peat, Phenol and PPM, by Dr P. Brossard" (PDF). Retrieved 2008-05-27. ^ "Bruichladdich". Bruichladdich. BDCL. Retrieved 8 August 2015. ^ Juteau, P.; Côté, V; Duckett, MF; Beaudet, R; Lépine, F; Villemur, R; Bisaillon, JG (2005). "Cryptanaerobacter phenolicus gen. nov., sp. nov., an anaerobe that transforms phenol into benzoate via 4-hydroxybenzoate". International Journal of Systematic and Evolutionary Microbiology. 55 (Pt 1): 245–50. doi:10.1099/ijs.0.02914-0. PMID 15653882. ^ Rehfuss, Marc; Urban, James (2005). "Rhodococcus phenolicus sp. nov., a novel bioprocessor isolated actinomycete with the ability to degrade chlorobenzene, dichlorobenzene and phenol as sole carbon sources". Systematic and Applied Microbiology. 28 (8): 695–701. doi:10.1016/j.syapm.2005.05.011. PMID 16261859. ^ a b Budavari, S, ed. (1996). "The Merck Index: An Encyclopedia of Chemical, Drugs, and Biologicals". Whitehouse Station, NJ: Merck. ^ Lin TM, Lee SS, Lai CS, Lin SD (June 2006). "Phenol burn". Burns: Journal of the International Society for Burn Injuries. 32 (4): 517–21. doi:10.1016/j.burns.2005.12.016. PMID 16621299. ^ Warner, MA; Harper, JV (1985). "Cardiac dysrhythmias associated with chemical peeling with phenol". Anesthesiology. 62 (3): 366–7. doi:10.1097/00000542-198503000-00030. PMID 2579602. ^ U.S. Department of Health and Human Services. "How can phenol affect my health?" (PDF). Toxicological Profile for Phenol: 24. ^ Hanscha, Corwin; McKarns, Susan C; Smith, Carr J; Doolittle, David J (June 15, 2000). "Comparative QSAR evidence for a free-radical mechanism of phenol-induced toxicity". Chemico-Biological Interactions. 127 (1): 61–72. doi:10.1016/S0009-2797(00)00171-X. PMID 10903419. ^ "Medical Management Guidelines for Phenol (C6H6O)". Agency for Toxic Substances and Disease Registry. U.S. Department of Health and Human Services. October 21, 2014. Retrieved 8 August 2015. ^ Brown, VKH; Box, VL; Simpson, BJ (1975). "Decontamination procedures for skin exposed to phenolic substances". Archives of Environmental Health. 30 (1): 1–6. doi:10.1080/00039896.1975.10666623. PMID 1109265. ^ Hunter, DM; Timerding, BL; Leonard, RB; McCalmont, TH; Schwartz, E (1992). "Effects of isopropyl alcohol, ethanol, and polyethylene glycol/industrial methylated spirits in the treatment of acute phenol burns". Annals of Emergency Medicine. 21 (11): 1303–7. doi:10.1016/S0196-0644(05)81891-8. ^ Pullin, TG; Pinkerton, MN; Johnston, RV; Kilian, DJ (1978). "Decontamination of the skin of swine following phenol exposure: a comparison of the relative efficacy of water versus polyethylene glycol/industrial methylated spirits". Toxicol Appl Pharmacol. 43 (1): 199–206. doi:10.1016/S0041-008X(78)80044-1. PMID 625760. 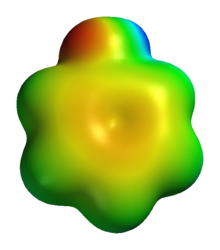 ^ PubChem. "Phenol". pubchem.ncbi.nlm.nih.gov. Retrieved 2019-03-19. Look up phenol in Wiktionary, the free dictionary. Wikisource has the text of the 1911 Encyclopædia Britannica article Carbolic Acid.